Creating dipping baskets with egg crate partitions for small rounded parts. A metal finishing company came to us for help with plating small, highly polished and rounded component parts for a sophisticated aerospace application. The plating material thickness had a very tight tolerance and the parts needed to be individually segregated to assure total coverage. 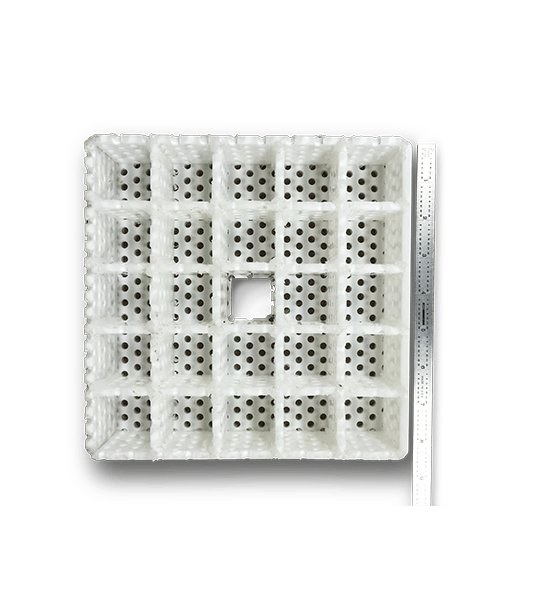 We designed a 7-1/2” X 7-1/2” X 2” tall rectangular dipping basket with “eggcrate” partitions using perforated polypropylene sheet 3/16-inch thick. The 1-1/2” X 1-1/2” X 2” tall partitioned compartment functioned exactly like individual plating tanks. The customer was ecstatic! With only our “Little Dippers” they were able to bring in new business opportunities for a very meager equipment investment. The cost of the dipping baskets was returned in just a few month’s time. As a bonus, post plating finishing labor was also dramatically reduced.